Join the discussion on our forums! 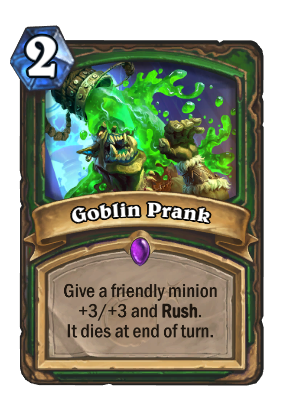 Come discuss Goblin Prank over in our dedicated Goblin Prank discussion topic. If you put this on a minion and then use Dire Frenzy on said minion, is it an +6+6 in the deck then? Stonetusk Boar + Goblin Prank + Dire Frenzy x2. Then, Master's Call, and the later go face with your 7/7 boars. "It's more of a social experiment." Yes, charge overwrites rush. Also (as it seems a few people were confused by this) giving a minion rush when it's been sitting on the field will not stop it from being able to hit face. Egg hunter likes this card, don't skip on it. Throw it on an egg and it can kill another minion, then pop itself at the end of the turn. Destroying your egg is bad. It means you can’t trigger its Deathrattle anymore. That seems to be good. For sure better, that hunter legendary. All of that is terrible. They rotated Power Overwhelming out for a reason. It gives the minion rush tho. But it s not died horibly, so for 1 more mana and smaller static u have clean conscience. U also get rush, hwat can be usefull. So when you play this on a minion, you can't attack face right? Even if it's been there for a few turns? I really can't see this card working out. Why would you play this in your deck? You're better off with a Hunting Mastiff imo.